The HTC One M8 manual or user guide is available now. The manual is very important for owner becuse provide many instructions to setting and reset the the smartphone. 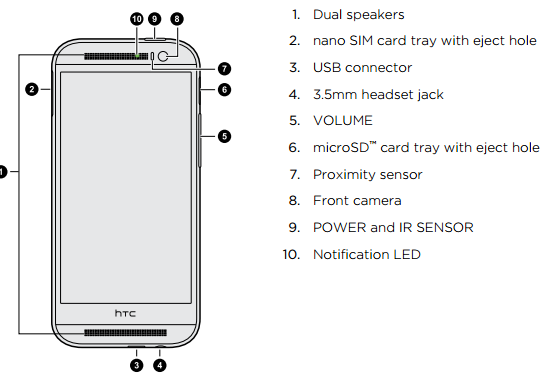 The HTC One M8 measuring 146.4 x 70.6 x 9.4 mm. It's powered by 2.3 GHz quad core Qualcomm MSM8974AB Snapdragon 801 processor and run on Android 4.4.2 Kitkat operating system. It has 5.0 inches Super LCD3 capacitive touchscreen with a resolution of 1080 x 1920 pixels.It's also equipped with Corning Gorilla Glass 3 protection plus and HTC Sense UI version 6 features. There are 16 GB internal storage, 2 GB of RAM, and microSD up to 128 GB. This smartphone also equipped with 5 megapixel front facing camera and powered by Li-Po 2600 mAH battery capacity (non removable). The HTC One M8 User Manual consisting of 201 pages with file size of 4.17 MB. It's available in english language. This manual provide reference information such as Switching the power on or off, Setting up your new phone, Restoring your backup from your online storage, Transferring content from an iPhone, Using Quick Settings, Updating your phone's software, Downloading apps from the web, and Uninstalling an app. Then about Basics operations, Ringtones, notification sounds, and alarms, Lock screen, using camera for taking photo on page 63, Recording video, Using Zoe camera, Using HDR, Saving your settings as a camera mode, Trimming a video, Editing your photos on page 77, mking call, Setting up a conference call, Copying a text message to the nano SIM card, Searching HTC One and the Web, using FM radio, TV, GOogle drive, HTC Sync Manager, backup, Using Scribble, GOogle maps, Using HTC One as a Wi-Fi hotspot, using Wi-fi and bluetooth, and phone settings guide like Automatic screen rotation, Setting when to turn off the screen, Changing the display font, Lock screen notifications, Setting a screen lock, Navigating HTC One with TalkBack and more.